Hi! @lunchesandlittles here! I am a Mama of three little ones, and love to make meals fun (find out more about that on my feed! ), but my husband and I also like to keep a beautiful home. Recently, we collaborated with Room & Board to put together an amazing space, and today’s the big reveal. I am so excited to share it with you, so let’s get right to it! We have three young children, two are boys, and even though they are 19 months and four years old, they are already best friends. At the beginning of the summer our oldest started talking about sharing a room with his brother. At first, we dismissed it, but he persisted, and while we didn’t know how it would all work out, we decided that it was a good idea. 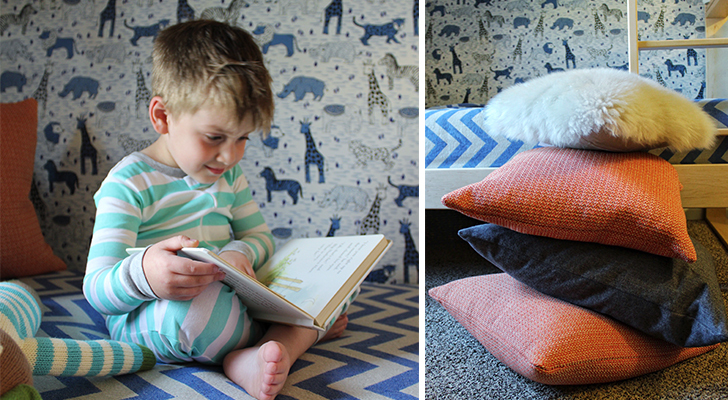 So we set out to design a boy’s room, that was suitable for play, fun and sleep… For two! Creating a shared space for an infant and a toddler had its challenges. We wanted something fun and age-appropriate but also wanted to be sure to avoid a nursery feel. We wanted the space to be one that they could grow into. And we wanted a room that would allow for playtime, but not too much that sleep would be compromised. Also, while knowing we were short on space (120 total square feet) we knew we still wanted to incorporate various elements into the room, so we needed to maximize the space we had. And of course, we wanted something modern, but needed to be realistic; after all they are little boys! In two words we wanted functionality and quality. 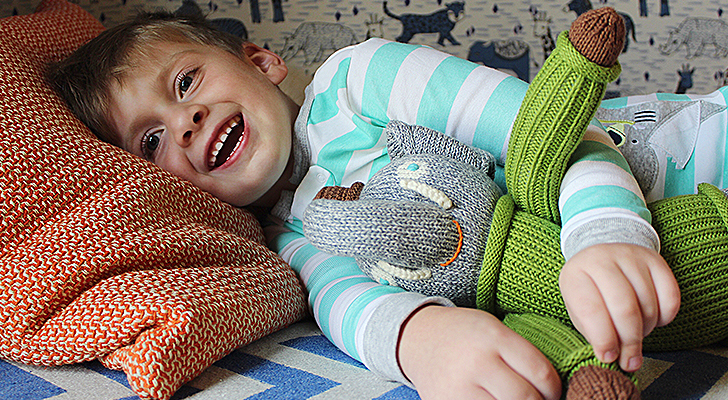 And between the boys, we knew we also wanted to incorporate blues, animals, and LEGOS®! While it wasn’t in the forefront of our four-year-old’s mind, quality, modern design was in the forefront of ours, and that was how we ended up at www.roomandboard.com. We have other pieces of theirs in our home, and knew the level of quality (and service) we would receive from their company would be unmatched. So, Room & Board was where we started. The first thing on our list was choosing a bed. We knew seeing how a bed would fit into the space would ultimately help us with planning for the rest of the room. So that was step one. My husband and I also knew because of the size of the space we needed to do bunk beds (we chose to renovate the spare room next to our own room, so that we could be as close as possible to our youngest for the transition, but the closest room to ours is also our smallest room in size). Of course, our four-year-old did not have any complaints when we introduced the bunk bed concept. In fact, he couldn’t wait. 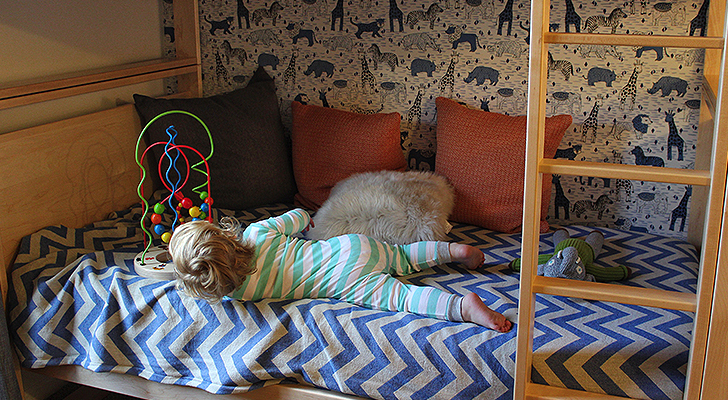 We initially really liked the look of the Waverly Mini Bunk Bed, and loved that the bottom bunk would be right on the floor for our youngest, which we knew would make his transition a little easier. The Waverly had so many pros and such a fun look, we decided that we wanted to separate the bunk into two twin beds down the road. We settled on the Dayton Bunk Bed in maple and have no regrets. One thing that we have always been concerned about with bunk beds is sturdiness. We don’t want any of our little ones climbing up into a bunk bed on a wobbly ladder. The Dayton is both beautiful and completely solid. I can’t begin to describe the quality of this piece of furniture. And, the maple was the perfect color for the space. 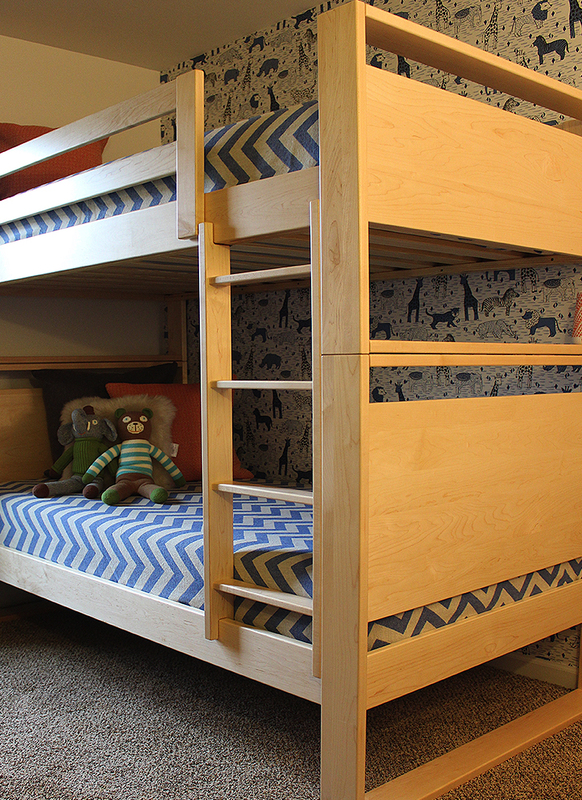 Our oldest already loves his top bunk, and again, we love how sturdy this piece is. And for our youngest, we really like that the bottom bunk is only 13 inches off the ground. We plan to slowly transition our babe into his bottom bunk, which we will have a guard rail attached to. Room & Board has some of the most beautiful textiles and pillows for home that we’ve ever had. We have some of their oversized throw pillows for our living room and we love them so much. Getting some of their bedding and extra pillows for the boy’s space was something we definitely wanted to do, and right away we found these Ascent Blankets in Cobalt and Oatmeal. The blue is such a unique shade; not baby-ish at all. Instead, it is modern, fun, and versatile. We ordered these blankets before we even ordered the bed. They became the center of the design and color palette for the space. We also chose a couple different throw pillows that the boys can use in their beds, when reading, playing or watching a movie. Our picks included the following: Temple Pillows in Tangerine, Kingsman in Charcoal, and a soft Sheepskin pillow in Stone (my personal favorite!). I love the combination of different textures and patterns in this mix. Great for bedtime, and playtime: perfect to lean on when reading a book or building little masterpieces, etc. 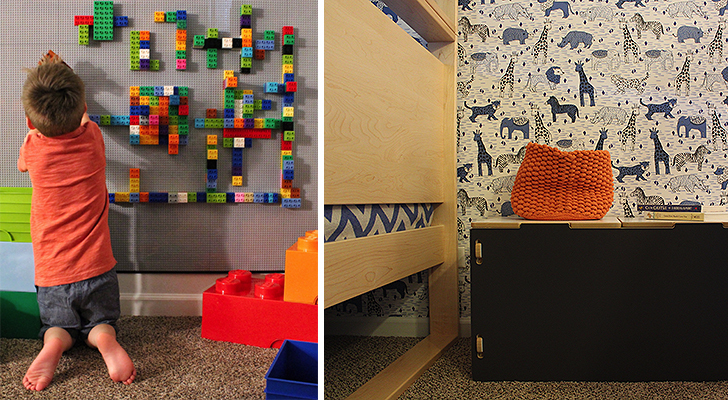 LEGO Wall – Using self-adhesive baseplates from Creative QT, we assembled an almost 5 x 4-foot LEGO wall. We had the idea of doing a LEGO table, but really love how large we were able to do the wall. The size allows both boys to play at the same time, and it has already provided hours of fun. So easy to build; no glue required! Smart TV – My husband and I went back and forth on putting a TV in the bedroom. We’re big on limiting screen time, but we also value educational programming and apps and embrace the occasional movie night! We chose to put a Smart TV in the space, and the great thing about a RokuTV is that it does not have to be connected to your cable (ours is not). We will use it with our son(s) as we see fit, with a strong focus on education. I love having this option in the room. Feature Wall –To tie the room all together and really bring out the beautiful blue in Room & Board’s Ascent Blankets, we worked with The Better Wallpaper Co. on a feature wall. It really gives the room some extra personality, and we couldn’t be happier with the outcome. 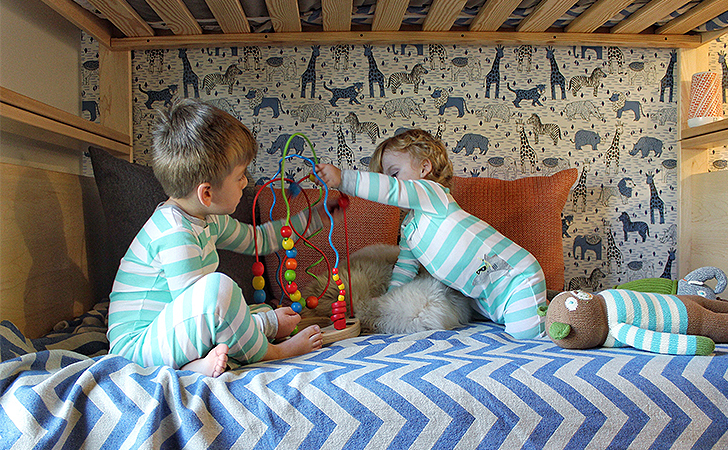 The Better Wallpaper Co. took an already popular design of theirs and color-matched the wallpaper to our blankets. I love how the blankets and the wallpaper complement each other and how the blues and the animal print draws you in. This was a project we could complete in less than 2 hours from start to finish, perfect for transforming any space, quickly! We left all the other walls white so the focus would really be the feature wall with the bed. The white walls also really help brighten up the room overall. *Additional room details at the end of this post. We ordered our furniture and extras on the Room & Board website and I can’t talk about Room & Board without mentioning how seamless everything was—the ordering, delivery and set up. We order a lot of things online and sometimes that experience can be really impersonal, but not with Room & Board. After placing our order, we received a phone call from an associate who set up a delivery date with us for the following week. They later reminded us and confirmed the appointment the day before with a two-hour delivery window. And then the day of delivery, the installers arrived right on time. The associates came in, set up the bed, delivered the other items, and left the room in perfect condition. They worked with us on where to place the bed and how to separate the beds down the road. They made sure that we were completely comfortable—and certain that this bed was the right fit before they left. Room & Board really goes above and beyond when working with their customers and their attention to detail is always so appreciated by my family and me. I can’t say enough about the quality of products and customer service behind the Room & Board team. From the very first visit to their website, to working with a couple different Design Associates to get advice on different furniture options, color palette, and even how to mix pillow textures, to the delivery itself, Room & Board took such good care of us from start to finish and were central in helping us create a room that is already so loved by our boys. With their help, we turned a small, 120-square-foot room into a modern, fun, and functional space. Thank you Room & Board; we are all smiles here! *Wooden “The Boys” Sign from The Polymath Mom/ Etsy + Knit Dolls from Bla Bla Kids + Modern Toy Box in grey from Sprout Kids + Jumbo Stuffed Zebra from Melissa and Doug Toys + LEGO Brick Storage Containers from Modern Intentions – Visit @lunchesandlittles on Instagram for additional room details. 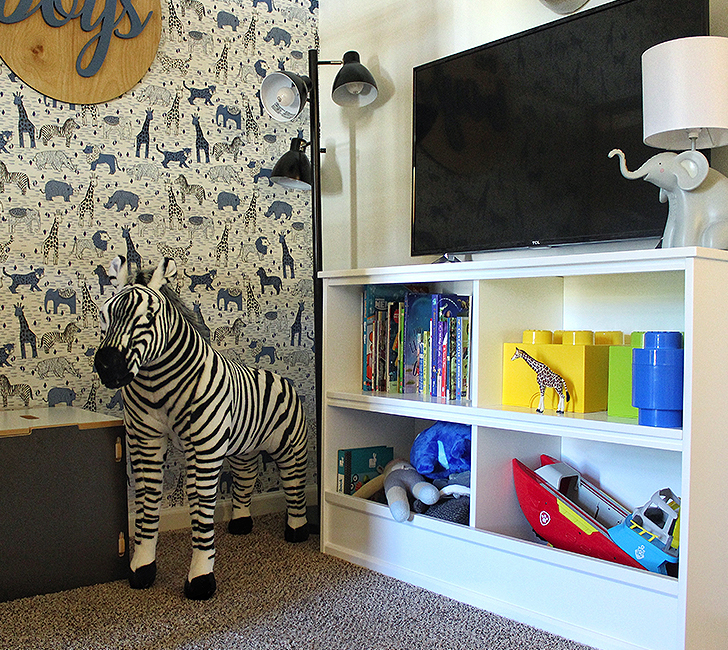 The Room & Board product featured in this post was gifted to LunchesandLittles for her kids’ bedroom. All opinions are her own.